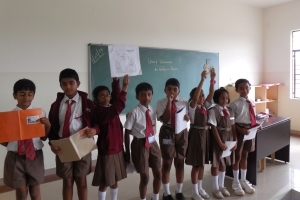 The curriculum is activity based learning with hands on experience and extensive co-curricular activities. NPS is committed to imparting a strong foundation to children of grades 1-5, in various disciplines such as English Mathematics, Social Science, Life Science, Language Studies, Environment Science and Information Technology. A continuous and comprehensive assessment pattern has replaced the traditional examinations in the Primary Year Programme. In order to remove the tedium in classroom, a wide range of classroom technique of teaching is used - such as, group discussions, seminars, projects, guest talks and several unique resources have been developed on the lines of ‘do and learn’ technique. This makes the entire learning process thoroughly enjoyable one. Yoga, music, craft, cookery and a host of other such activities are woven into the curriculum framework to expose children to various other pursuits other than mere academics. Students start using Maths Lab from Grade 1 which will help them sharpen their analytical skills and Junior Science Lab for hands on learning. Establishing good work habits like persistence, independence, time-management and appreciation of values of learning begin at this stage. Grade 5 is introduced with an additional language.